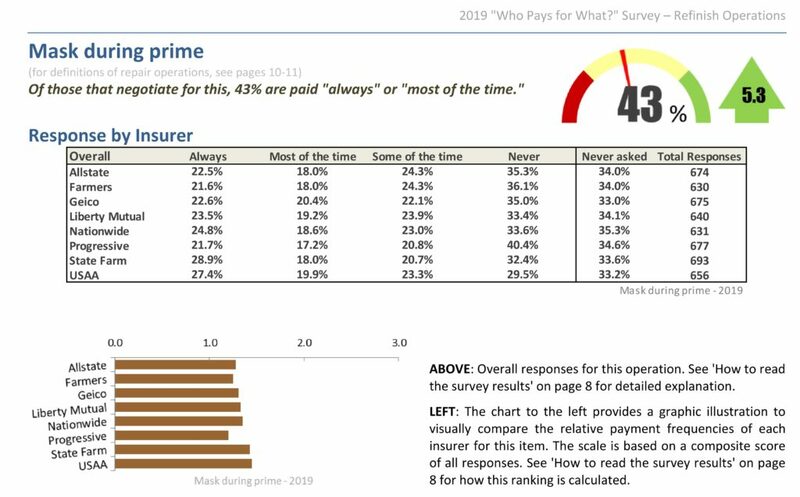 The proportion of shops reporting being “always” or “most of the time” paid by eight leading insurers for masking ahead of priming has nearly doubled since 2015, the latest “Who Pays for What?” survey has found. The January poll by Collision Advice and CRASH Network focused on insurer behavior regarding not-included refinishing procedures and drew hundreds of responses from repairers nationwide. “Mike Anderson of Collision Advice said the (masking) change is a good indication the industry is increasingly aware of the not-included procedures shops often do without seeking compensation,” the two companies wrote in a news release Monday announcing the results and touting the latest quarterly survey. 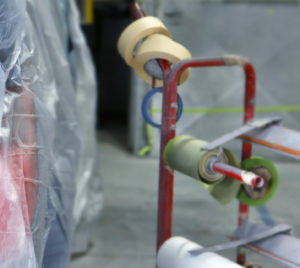 Help the industry by taking the current “Who Pays for What?” survey on not-included body repair operations through April 30. All answers are kept confidential — data is published only in the aggregate — and participants receive a copy of the report. The 2015 “Who Pays for What?” study found only 24 percent of shops were overall being paid “always” or “most of the time” when they asked State Farm, Allstate, GEICO, Progressive, USAA, Nationwide, Liberty Mutual and Farmers to be compensated for masking to protect from overspray before priming. By 2018, that proportion had risen to 37 percent. This year, 43 percent of more than 600 responding shops were consistently being reimbursed for their bills. But about a third hadn’t even asked, the results show. As is usually the case, State Farm and USAA were overall the best about consistently reimbursing. However, a breakdown by DRP and non-DRP shops revealed them to be noticeably better about paying their network repairers than non-DRP shops. Ironically, other insurers — notably Progressive and Allstate — appeared harder on their DRP shops.